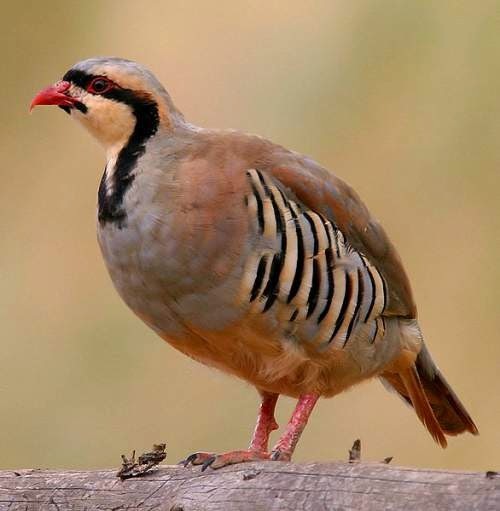 Home › National bird of India › See-see partridge › Chukar partridge. The chukar partridge (Alectoris chukar) belongs to the pheasant family Phasianidae. It is a game bird and is widely distributed in its native range in Asia, including India, Israel, Lebanon, Saudi Arabia, Syria, Iraq, Iran, Afghanistan, Turkmenistan, Afghanistan, Uzbekistan, Kazakhstan, Tajikistan, Pakistan, Nepal, China and Mongolia. These partridges are also found in Greece, Turkey and Cyprus. In India, they are found in Kashmir and western Himalayan belt. There are sixteen recorded subspecies, of which A. c. pallescens and A. c. chukar occur in India. These partridges have been introduced widely as game birds and there are well established feral populations in UK, Russia, USA, Canada, Mexico, Chile, Argentina, Hawaii and New Zealand. The IUCN (International Union for Conservation of Nature) has categorized and evaluated these species and listed these birds as of "Least Concern". These birds are medium sized, measuring 30-40 cm in length and 450-800 grams in weight. The males are larger than the females. They inhabit all terrains and avoid rainy humid regions. They are found in altitudes as high as 4,000 meters and are also found in the Dead Sea areas. They feed on seeds, grains, cereals, bulbs, shoots of grass, berries, insects and other invertebrates. They breed during summer months and the ground nest is scantily lined. The nest may contain a clutch of up to 15 eggs. The male is monogamous and chick follow the parents for feeding. The bird may rarely fly for short distances. 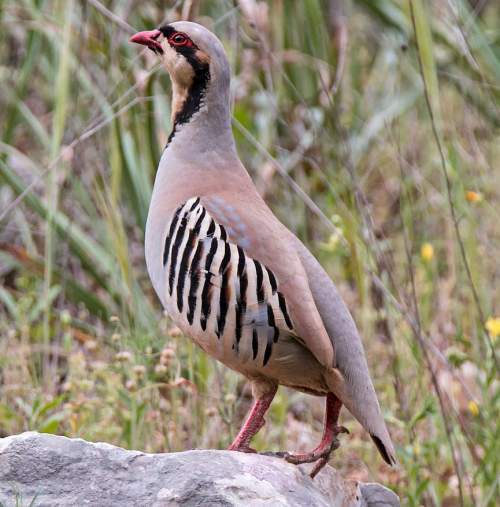 Current topic Birds of India: Chukar partridge.